For me, it all started with mohinga back in 2007. That’s me in that pic, joyously slurping down a bowl somewhere in Burma. 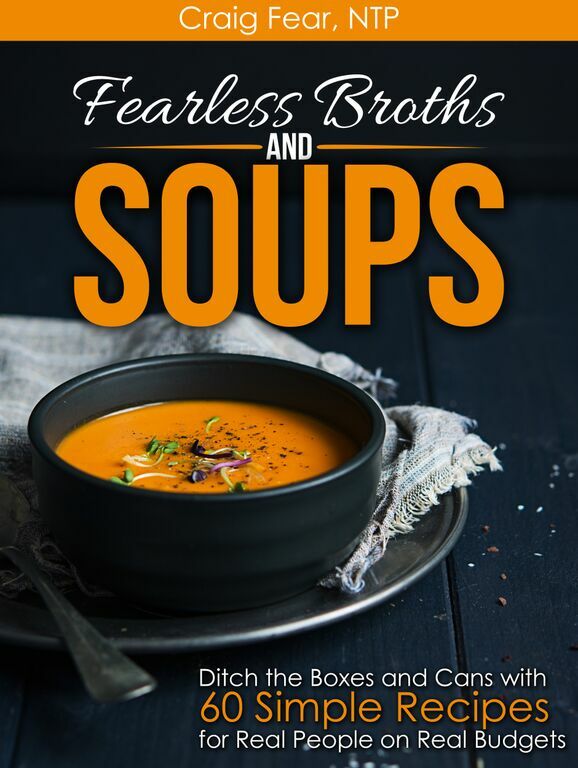 Although I didn’t know it at the time, it would inspire me to write my latest book, Fearless Broths and Soups: Ditch the Boxes and Cans with 60 Simple Recipes for Real People on Real Budgets. 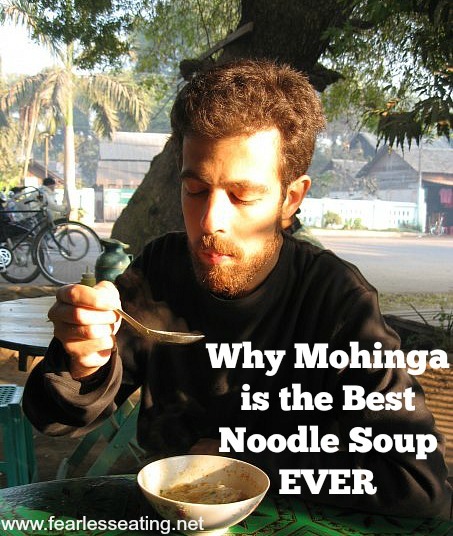 The following is an excerpt from my book in which I explain why I consider mohinga the greatest noodle soup EVER. 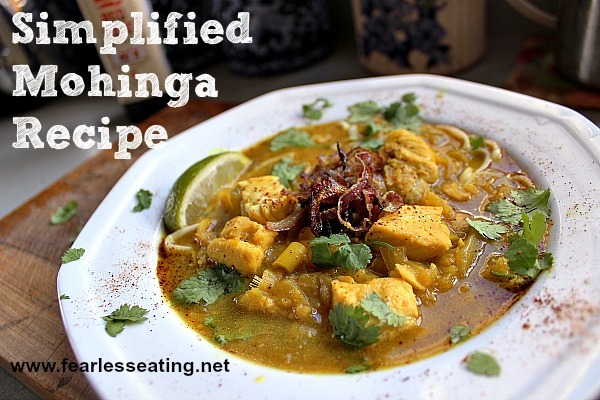 I hope it inspires you to make the simple mohinga recipe that follows! Back in 2007 I traveled to Burma for two months. Now Burma might not seem like the most popular destination on the globe but the primary purpose of my trip was to deepen a Buddhist meditation practice I’d learned several years earlier. Burma is a deeply Buddhist country and though not well-traveled by many westerners, offers many opportunities for the study and practice of meditation. But meditation wasn’t the only purpose of my trip. To be honest, I’m not the most noble of meditation practitioners. Too much meditation and I go a little stir crazy. Being in a foreign place, naturally I wanted to experience the country outside the confines of meditation centers. Little did I know that the secondary intention of my trip, to travel and see the country, would lead to a serious addiction. The first time I tried it in Yangon, I knew I was hooked. From that point forward, I could not start my day without it and I would do whatever it took to find the best sources. On a few occasions, that meant wandering down a dark alley where few foreign travelers ever set foot and no English was spoken. The locals always knew why I’d come. Knowing head nods and sly smiles were the only form of communication needed. But more commonly, to get my daily fix, it simply meant stepping right outside my hotel and getting it on the street. Be it the cities of Yangon or Mandalay, small towns and villages, the sacred temples of Bagan or even inside the meditation centers themselves, the source of my addiction was everywhere. Mohinga is the national dish of Burma, a traditional soup with such exquisite flavors, that it’s as if all the quintessential flavors of Southeast Asia come together in perfect balance and harmony. Though technically not a drug, in the Buddhist sense, where everything within the net of our senses can cause intense craving and desire, it’s pretty damn close. Mohinga starts with a fish broth. Now that may not sound very exciting but it’s what’s added to that broth that makes it so divinely delicious. Lemongrass, banana stem, ginger, garlic and onions slowly simmer away and infuse the broth with both an herbal, lemony sweetness and a pungent earthiness. Fish sauce gives the broth a subtle-but-not-too-subtle fish essence and fresh local fish gives it all a hearty boost. All of that sweet, sour, salty deliciousness is then ladled over rice noodles and then served with sides of fresh lime, dried red chilies, cilantro and more fish sauce. You add as much or as little as you want depending on your personal tastes. Hardboiled eggs, crispy fried onions, a crispy fish cake, and other herbs and spices are often part of the broth and accompaniments as well. Different areas of the country have different interpretations and ingredients. Yangon (formerly called Rangoon) mohinga is slightly different that Mandalay mohinga and so forth. And in Burma, they primarily have it for breakfast. I would wake up with such a craving for it that I could barely function until I had my fill. It is hands down the best noodle soup I’ve ever had and if I ever go back to Burma, my primary purpose will be for mohinga. Spiritual enlightenment is now a distant second. Now truth be told, I originally had no intention of including a mohinga recipe in my new book. And that’s because I’d never made it. For years, it intimidated me. I knew there was NO WAY I could duplicate the real thing. For starters, I didn’t have many of the local ingredients native to Burma. I thought for sure I’d be disappointed. But I decided to get over it and do what I always do – experiment with a simplified version. This recipe was my very first attempt. And I was thrilled with the results. It may not be “authentic” but it’s a great example of improvising and doing the best you can with what you have! Burma's most popular noodle soup, mohinga is a fragrant blend of southeast Asian herbs and spices all swimming in an earthy rich broth. Dice onion, garlic and ginger in a food processor and saute in coconut oil with lemongrass until fragrant, about 3-5 minutes. Add turmeric and chili powder and saute another minute. Add fish broth and bring to a boil. Reduce heat and bring to a simmer. Add chickpea flour and stir until mixed well. Simmer for 10-15 more minutes until slightly thickened. Prepare noodles according to package directions. If using fried onions (which I highly recommend), fry them in coconut oil while soup is simmering. Fry until well browned but now blackened. Drain from oil and set aside. My new book will show you! In Fearless Broths and Soups, I take many traditional soup recipes, just like mohinga, and pare them down into 3 simple steps. They’re geared to all you stressed out moms and dads, workaholics and non-cooks trying to figure out how to eat well with limited funds and time.